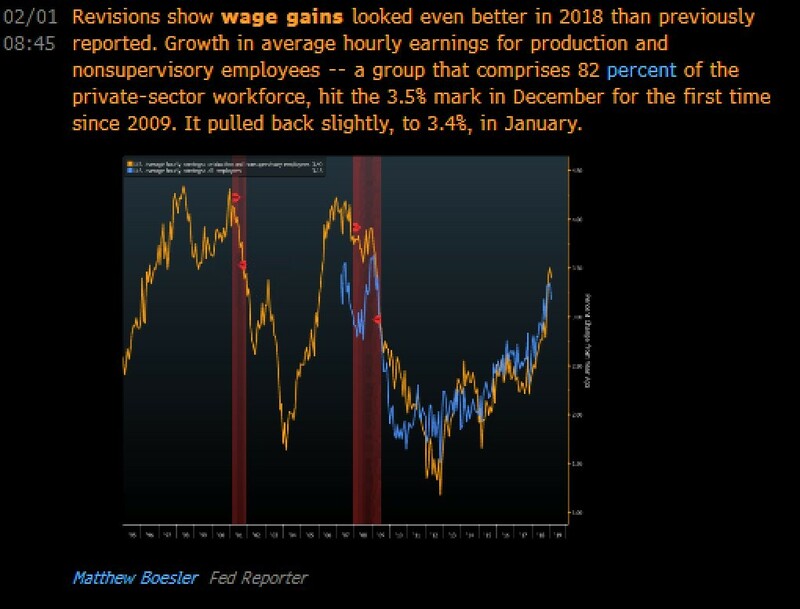 Wage growth is important because at this point in the cycle with the labor market tightening and inflation modest, workers have a chance to get real pay increases. Also, last year we saw the Fed raising rates partially in reaction to wage growth even though it hasn’t translated into higher inflation. In the first part of the cycle, unemployed workers got jobs. Lately, discouraged workers are coming off the sidelines and looking for work. It’s interesting that these people coming off the sidelines helps prevent wage growth from getting out of control. But they are coming off the sidelines because wages are increasing. They are limiting the pay growth they want. It’s also notable that when employees are desperate for workers, they increase on the job training for those with little experience and those who haven’t been working for a while. Wage Growth - Average monthly hourly earnings growth in January was 0.1%. It missed estimates for 0.3% and last month’s reading of 0.4%. Average yearly hourly earnings growth was 3.2% which met estimates and was the same as December. Even though growth slightly decelerated, the average work week was stable at 34.5 hours which met estimates. Probably because of comps and rounding issues, weekly wage growth accelerated from 3.34% to 3.48%. Weekly wage growth has only been quicker in this expansion for 3 months in 2018. Growth peaked at 3.63% in October 2018. Last year, February weekly wage growth increased from 2.81% to 3.17% which means this might be a case where February 2019 wage growth falls from the previous month, but the 2 year growth stack increases. We don’t know what real wage growth in January was yet because the January CPI reading hasn’t come out. It will be released on February 14th. It won’t be affected by the potential shutdown because the BLS reported job numbers during the shutdown and because the shutdown deadline is February 15th. In December, CPI was 1.9% and core CPI was 2.2%. Markets are hoping for similarly low inflation. This cycle has been tough for shelter costs. For almost 8 years rent inflation has been higher than wage growth as you can see from the chart below. The past two cycles were much better. Finally, because of the revision to the December labor report, hourly wage growth was higher than rent inflation. This doesn’t make up for the almost 8 years of rent cost growth being above wage growth. The stabilization of rent inflation is similar to the stabilization of house price inflation. While last year was bad for housing, lower price growth has helped consumers this year. Either consumers will have more money to spend on other things or they will start buying houses at a quicker clip especially because of lower mortgage rates. This chart is the crown jewel for consumers. I expect when core CPI comes out, it will show another moderate level of shelter inflation. It will still be above core inflation, but it will remain off its 2016-2017 peak. We are at the point in the cycle where the lowest wage workers with the least education are doing relatively well. Their labor market is the most volatile because they lose jobs when the economy falters. Workers at the bottom rung of firms get laid off when business weakens. A firm isn’t going to fire management before the lower level workers obviously. These lower wage workers are also doing better because of the minimum wage hikes. 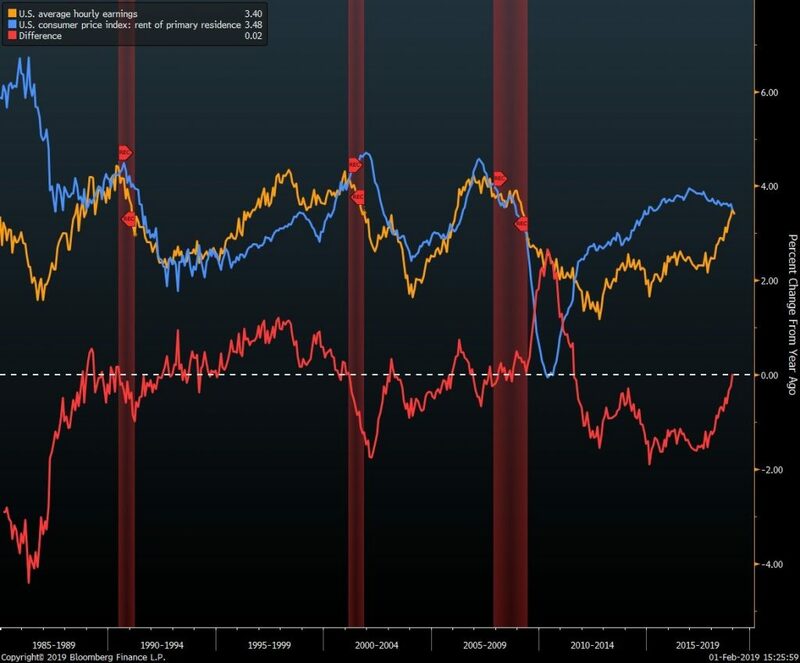 As you can see from the chart below, lower wage industry workers are seeing close to 4.5% wage growth while workers in middle income and upper income industries are seeing close to 3% wage growth. Wage growth was revised higher in December which pushed it above rent inflation. Those who are the most concerned about rent costs are people with production and non-supervisory jobs. This segment of workers compromises 82% of the labor market. Meaning it includes the lower class and middle class. As you can see in the chart below, wage growth for this group was 3.5% in December. That was the strongest growth in this expansion It was the highest since February 2009, when the unemployment rate was much higher. In January, the wage growth for production and non-supervisory workers pulled back about 10 basis points to 3.4%. It makes sense discouraged workers coming back into the labor market would limit wage growth for this group the most. After not working for a few years, a person isn’t likely to jump into a management position. 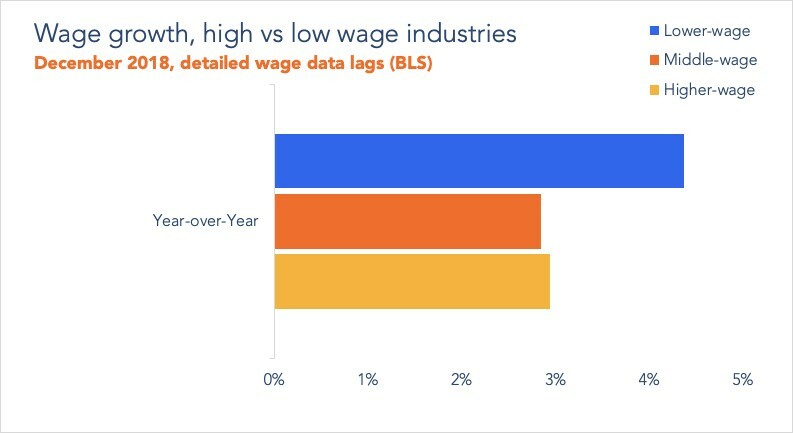 Industries with low paid workers have seen accelerated wage growth. The employment to population ratio of people without a high school diploma recently hit a record high. 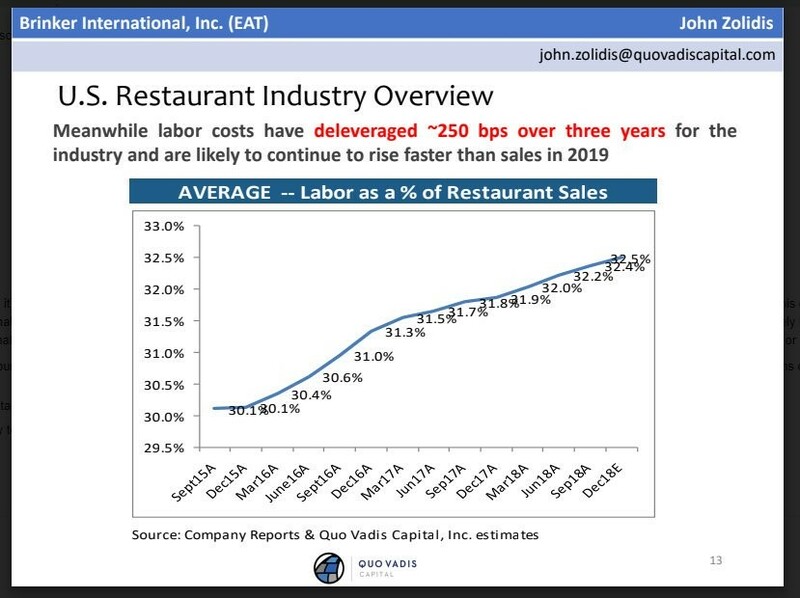 As you can see from the chart below, the restaurant industry has deleveraged as labor costs as a percent of sales has increased. In late 2015, labor costs were 30.1% of sales; in late 2018, labor costs increased to 32.4% of sales. Restaurants like real wage growth because it leads to more sales, but their margins are crimped by labor costs. The chart below adds more color to this discussion on wage growth for restaurant workers. It shows the ratio of average hourly workers at limited service restaurants compared to the national average. Limited service restaurants are like fast food places. They are notable for offering jobs to teens at the minimum wage. As you can see, this ratio has skyrocketed in the past few years to the highest level since at least 1990. 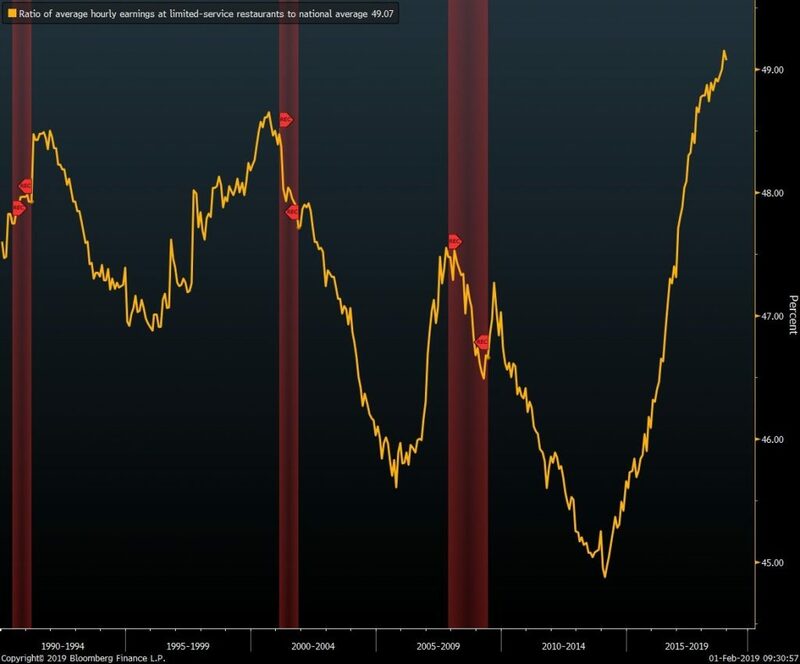 According to this indicator, the labor market is filled. However, there is still slack in the college graduate labor force. To be clear, the labor force participation rate increases with more education. Relatively speaking, those without a high school diploma are doing their best ever, while the labor force participation rate for those with a college degree hasn’t increased much this cycle. If the economy creates more jobs for college graduates, it will be great for the economy because they pay higher wages.